For plasmids is so much shorter than their host cell's genome (about 1/1000 in my case), it will take only 1/1000 time for it to replicate. With respect to cell cycle, when will that replication occur? I have a low copy number plasmids (pSC101) in E.coli, and I'm measuring a fluorescence protein expression level. The problem is, even if the plasmid copy number is known (N), depending on when it is replicated, the number of plasmid in my cell can vary. Therefore, I cannot directly infer expression level per plasmid. Higher expression level might just result from higher number of plasmids. For instance, if it is replicated right after cell division, I will have 2N plasmids for the most of my cell cycle. If on the other hand, it gets replicated right before cell division (and partitioning machinery delivers exactly half the number to each daughter cell), I will have N plasmids per cell for the most my my cell cycle. So, when do plasmids get replicated? I could not find a similar question here with search. Thank you very much in advance. I've found a nice review that has many details on plasmid replication in general, and several papers about pSC101 in detail, and I'll try to extract the key information from these papers. 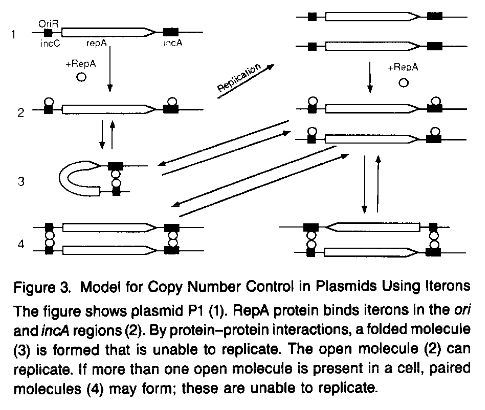 In many cases, the origin of replication contains directly repeated sequences, termed iterons, which are the binding sites for the plasmid-encoded Rep proteins and which have control properties. (...)iterons have been described for several replicons like P1, F, pSC101 (...). pSC101 plasmid has three of these iterons present, along with a protein called rep that is necessary for replication. Besides these there are sequences that provide binding sites for host proteins such as DnaA and integration host factor (IHF). Details of these can be found in this and this paper, both provides details on replication and the function of ori region in your plasmid. 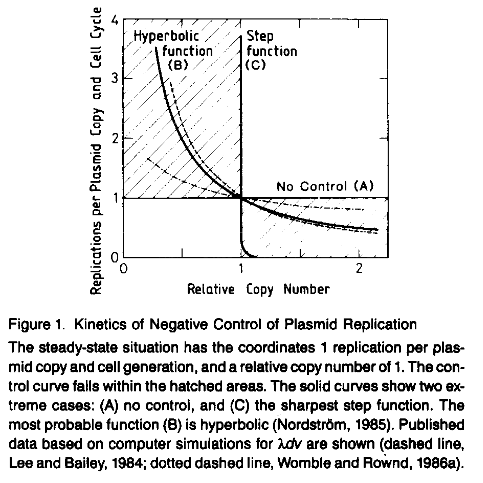 At steady state, the 1 number of replications per plasmid copy is exactly one per cell generation. This defines the steady state as shown in Figure 1. It should be stressed that while this is true for the population, it is not for individual plasmids-these are selected randomly for replication. In all experiments, plasmids pSG21 (oriS only), F'lac (oriS oriV),pBR322, and pSC101 were capable of replicating at all stages of the division cycle, with no detectable differences in the patterns. So bad news for you, because according to the paper above you cannot tell when your plasmid actually replicates. Yet still as the average copy number is quite stable due to reasons described above this may not pose a big problem. Keep in mind even if you have an extra plasmid for a short time that may still not cause problem, because transcription of your riporter gene, folding, etc takes time under which previously synthesized proteins might degrade. However this paper says the F+ plasmid replication is cell-cycle specific, you may wan to give it a try. Not the answer you're looking for? Browse other questions tagged microbiology ecoli plasmids replication copy-number-variation or ask your own question. Why do plasmids replicate on their own? Can Mono-Cell or other organism self-replicate? At which point does a cell switch its function? When doing minipreps, do “good” plasmids produce more DNA than “bad” plasmids?